It's the last day of July and the last day of Dress Month here at Cheryl Shops, so I'm wrapping it up with an outfit featuring pieces you've seen before (with one slight exception). It's a little segue into August—side note: how is it August already? !—a month in which I will be on a shopping diet in preparation for my trip to France at the end of the month. 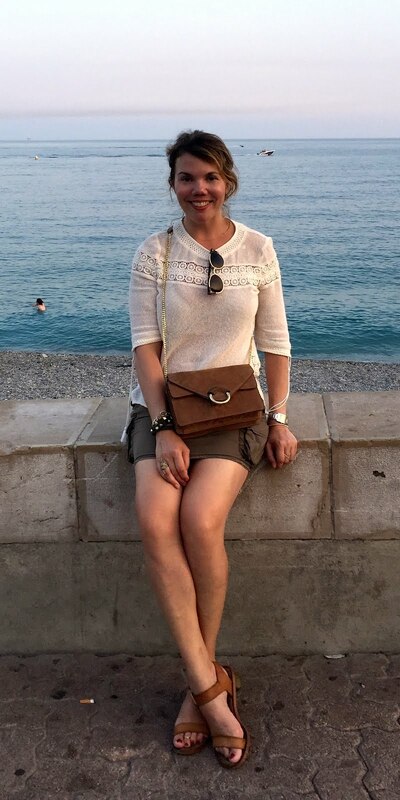 So until I go on a major shopping binge in Paris, I'll be finding new life in things I already own and resisting the urge to shop the clearance sales (or the new fall merchandise). So without further ado, here's my last dress outfit of July and my first throwback for August. You've seen this sweater before—most recently here—and as I mentioned last time, it's one of my favorites, as it's the perfect weight for San Francisco, and I love the color too. 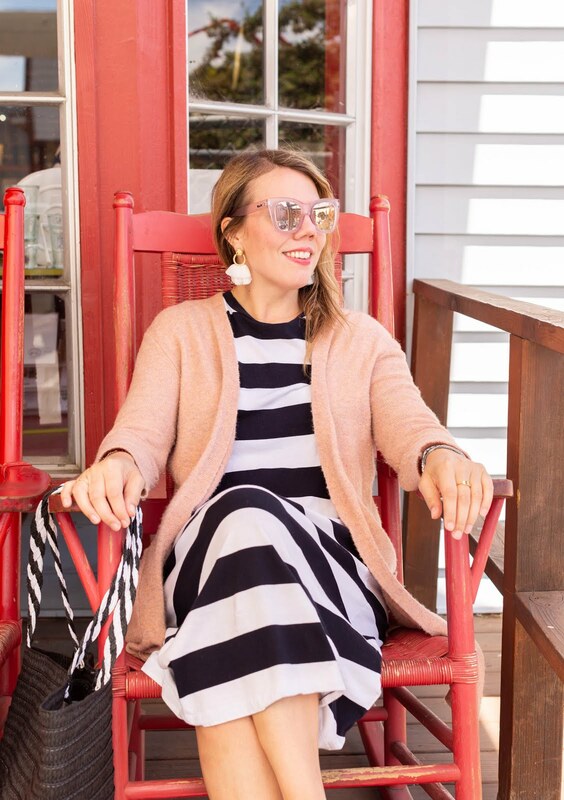 I realize that its shape does nothing to fix the bathrobe-and-nightgown vibe of my look, but hey, it was the weekend, and I was all about wearing my comfys. One important thing to note: this cardigan is on MAJOR SALE right now at Madewell—like, slightly over $20, which is an amazing deal, so you should buy one. I'd order it in another color, but oops, I'm on a shopping diet! This bag is the only thing you haven't seen before—I wore the earrings just last week and the Adidas sneakers last fall—but it's also part of the summer Box of Style that you can still score for an extra $30 off with code LASTCHANCEAFF. This bag is meant to be a beach bag, and it's probably great for that, since it's woven and the sand would hopefully sift through the cracks, but I've found it to be pretty helpful on days where I need to tote around a bunch of stuff—in this case, I had been at a picnic earlier in the day, and it was perfect. It's a little bigger than what I'd normally carry, but it's nice and lightweight. 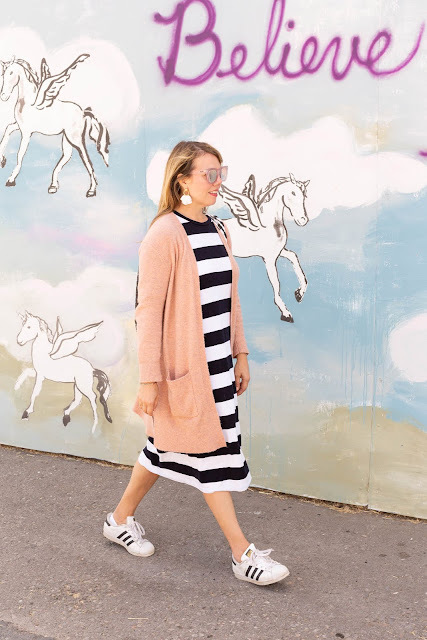 Said picnic is why I'm wearing sneakers too—normally I'd do sandals with a dress like this, but I was on gravel and wanted to keep my feet as clean as possible. 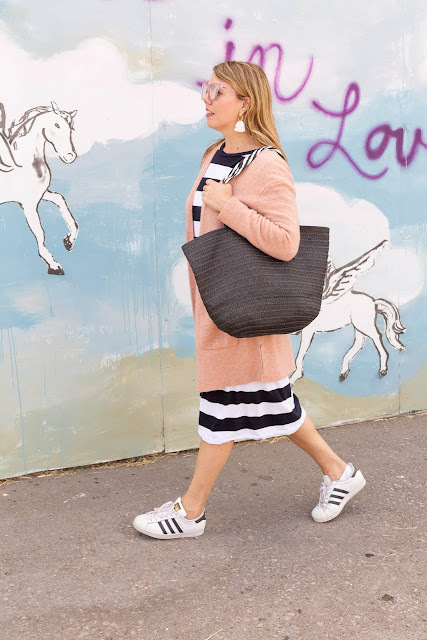 Adidas are just so classic, and I love how the stripes on the shoes echo the stripes on my dress and on the handles of the bag. We shot these photos in Point Reyes, California, a little town along the Marin County coastline. It's the home of Cowgirl Creamery (the best cheese in California) and a lovely public bathroom that I almost always have to utilize on the way to Hog Island Oyster Farm, where we had our picnic. I highly recommend stopping by for some oysters, and spending time in Point Reyes as well—it's worth it for these unicorn murals alone! 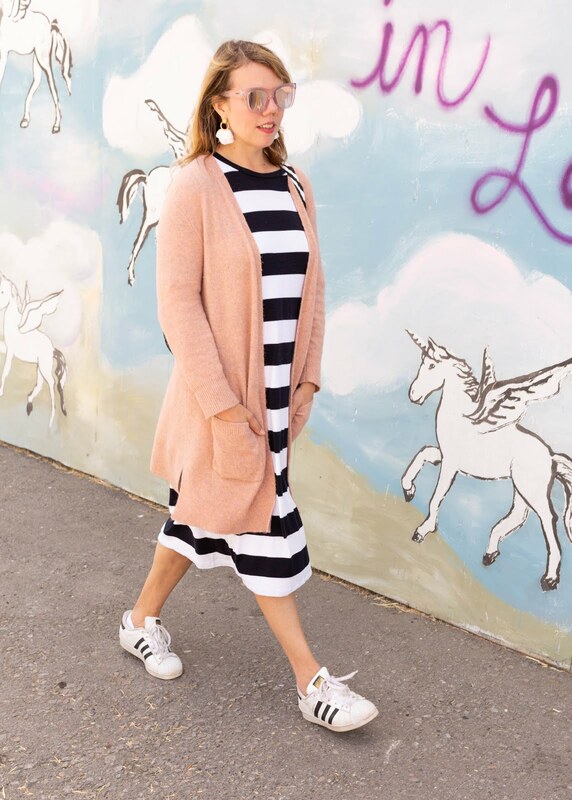 I love this cardigan on you with the black and white.T shirt dresses are great and this peachy color I love! 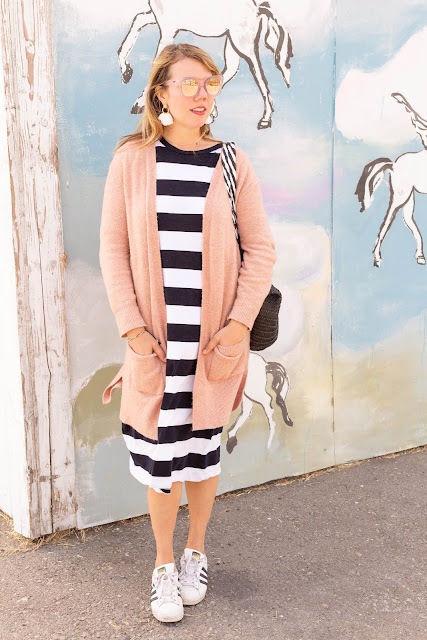 I could use some long cardigans for Fall, so I am keeping an eye out. Thanks for sharing more about Cali, I hope to visit at some point! This is such a cute and comfy outfit! The cardigan is the prettiest color! Love your dress, Cheryl. I would love one like this :) How sweet is the unicorn wall too. Thanks for sharing at The Wednesday Blog Hop. 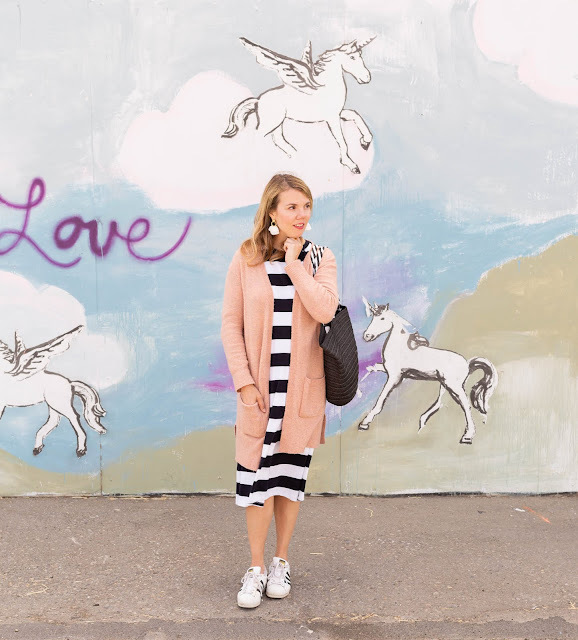 Such a fun and comfy look! This is the cutest t shirt dress! 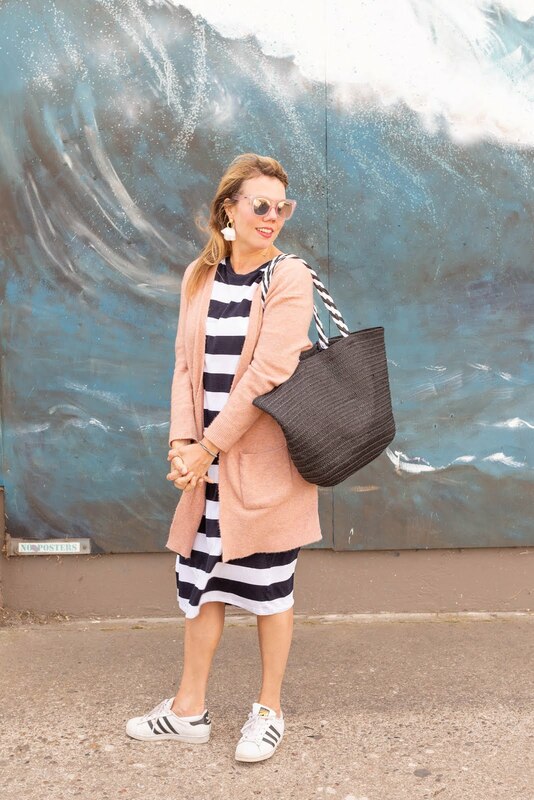 I love the stripes and totally agree that a t shirt dress can be worn so many ways!